Thousands of commuters face major delays after services in and out of London's Liverpool Street rail station were suspended. 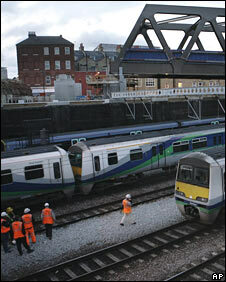 Services were disrupted after scaffolding from a new bridge fell onto tracks on Wednesday evening. Trains to Stansted Airport, and Southend in Essex, Cambridge, Ipswich and Norwich are affected. Network Rail is hoping to reopen the tracks by 1400 BST. Tube services at the station have not been affected. Services on the route are terminating at Stratford, Tottenham Hale, Hackney Downs or Seven Sisters. Network Rail warned passengers to expect "highly congested" services during peak time travel and said the journey into London could take an additional 60 minutes. A Transport for London spokesman said "just debris from engineering works" fell on the tracks rather than a partial bridge collapse as reported earlier. "The contractors were jacking up the bridge. The jack collapsed and debris from the supports for the bridge fell onto the tracks. We are investigating the incident," he said. On Wednesday evening, about three trains were stopped from entering the station and 300 passengers had to walk along tracks to Bethnal Green following the incident. Network Rail said engineers worked on the site overnight and the structure. The 1,300 tonne bridge had been inched across existing railway tracks using hydraulic rams, as part of the East London Line extension into Shoreditch.